Joe Quinones' interweb-log: HEROES CON 2008! Commissions! As promised, here's one of the commissions I did at Heroes Con last week. Enjoy! Ah, the fabled "Princess of Power." Too bad you couldn't include her beloved steed... Still love it, though! 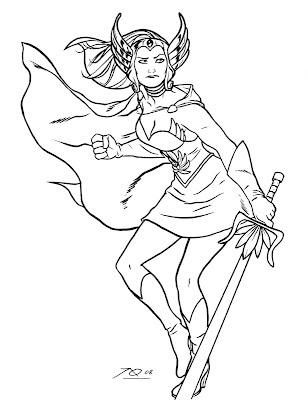 Oh man, I freaked when I saw She-Ra. Hey, I saw you working on that She-Ra! It was great getting to see you guys again. I'm sort of tempted to do a series of blast-from-the-past redraws.